Press tofu and crumble into a bowl. Mix in celery and onion. In a separate bowl, combine mayonnaise, yogurt, mustard, lemon juice and spices. Mix well. Add the dressing to the tofu mixture, and stir gently until combined. Use for sandwiches, wraps, and salad. 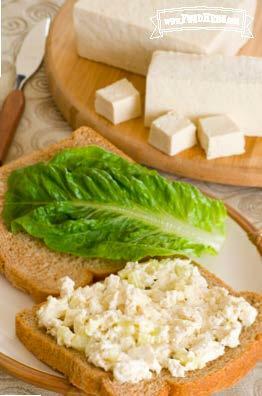 3 Comments for "Tofu "Egg" Salad"
Tried this recipe at an event recently. Wow I was really surprised by how tasty it is. I'll have to add it to my list to make at home now. We have a few eggless recipes on our site but that is not our focus. Mayonnaise substitutes without eggs are commercially available although they may be called spreads or dressing since mayonnaise is a legally defined food product. Read the ingredient list to be sure eggs are not included.